Giving subscribers a warm welcome is more than a display of good manners - it presents brands with a host of opportunities, from collecting more information about subscriber preferences to enticing would-be buyers back to an online store with an offer or promotion. We’ve already taken a look at the key components of a winning welcome email - now it's time to see them in action. Here are some of our favourite welcome email examples (for even more, check out our Pinterest board). Why we love it: It’s bold, bright and leaves you in no doubt about what the relatively new-to-the-scene line from Kate Spade is all about. Nice cheeky little discount for subscribers too. Why we love it: Vibrant and striking, we like how this welcome email immediately gives recipients the opportunity to customise their email preferences so that they can choose the designers they want to hear about - a great exercise in customer segmentation. They’ve also done a nice job of encouraging people back onto the website with a strong call to action and a navigation bar at the top. Why we love it: There has never been a stronger CTA than a red notification dot. * Combining strong imagery with a call for feedback (and a tempting message in the smallprint) is a winning marriage. Why we love it: Keeping things nice and simple, this welcome email is all about making us feel special with talk of exclusive previews, the latest news and early sale notifications. The introduction to the founder Tamara is also a nice personal touch. Jeez guys, you really shouldn’t have. Why we love it: An enticing subject line, strong images and a great ‘start shopping’ call to action; this email makes us want to hit the (virtual) shop floor right away. Why we love it: This welcome email radiates sophistication with its simple design, arresting imagery, and all-round class. Why we love it: ‘Five reasons we know you’ll love us’ is a bold statement to make - but this welcome email does a great job of convincing us of its veracity. Subject line: Welcome to American Apparel + 15% Off Your Next Order! 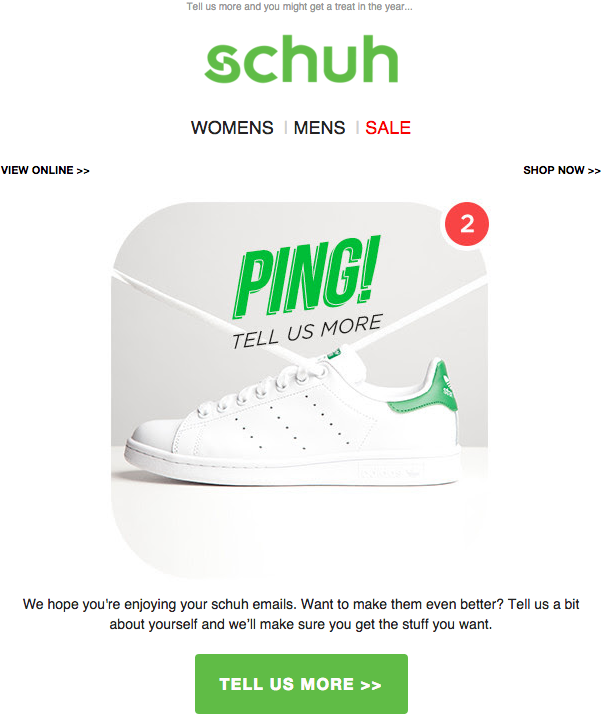 Why we love it: Luring us in with the promise of a discount in the subject line, we like how this newsletter encourages subscribers to follow American Apparel’s social communities, as well as driving home the brand’s message about sweatshops. Subject line: Welcome to the Party! Why we love it: This welcome email brings all kinds of treats to the email marketing party (it’s a rave, honest…), from free shipping to sneak peaks of lookbooks to competitions. Why we love it: We like anthing that moves. Combining moving images with the brand's range of social accounts creates a visually compelling CTA and drives subscibers onto multiple channels. Subject line: Here's Your 15% OFF Promo Code! Why we love it: We love how Bench has managed to turn the humble promocode into an artform in this clean, slick welcome email. 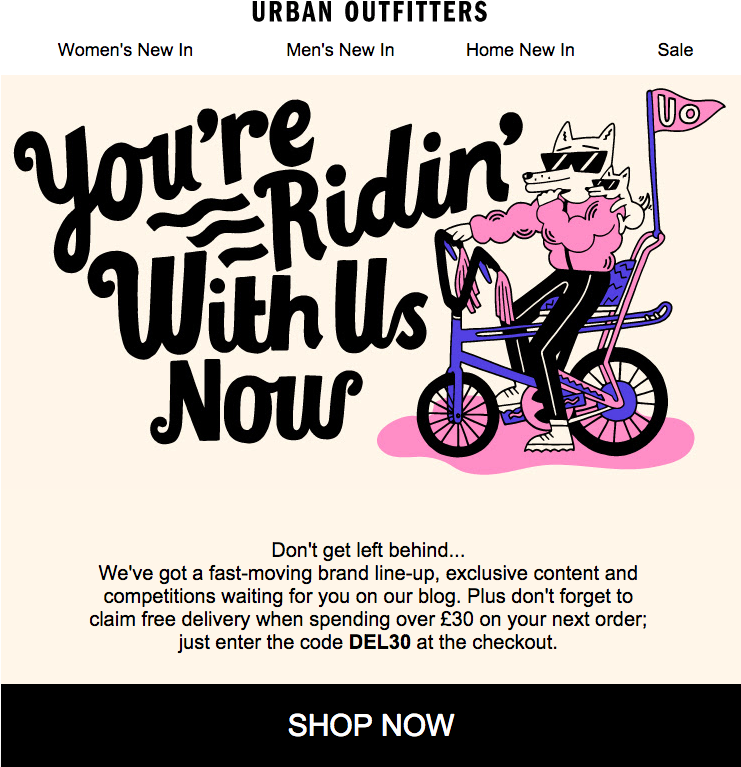 Why we love it: Urban Outfitters draws on its cool credentials to welcome new subscribers into its fashion tribe: employing tempting incentives and engageing visuals to draw traffic onto the (very large) shopping CTA.